It’s the top of Africa. A challenge for everyone who desires to challenge himself with extreme situations. 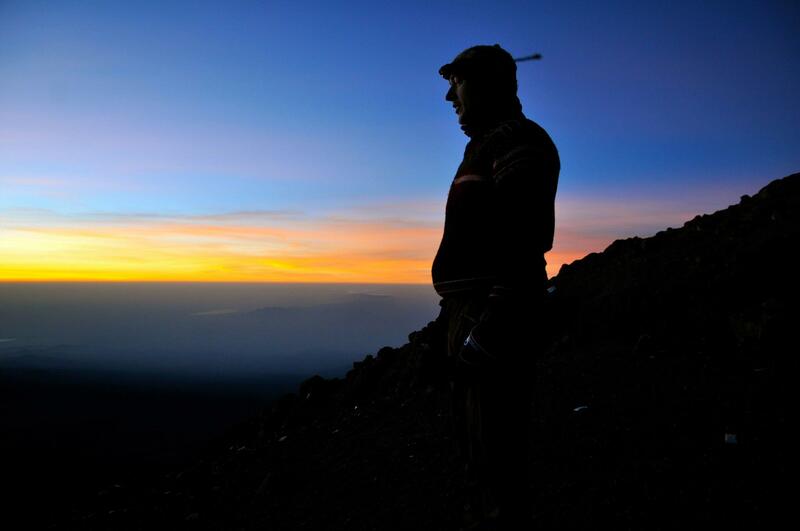 Almost 6.000m tall and free standing in Eastern Africa, the Kilimanjaro’s peak has been chosen to become the ultimate goal for a group of 5 people – including me – for some intensive 8 days. Behind us almost 6 months of preparation. The tl;dr summary: Wow, wow, and wow! That trip baffled me. Altitude is tough and the way up was chilly. My body didn’t like the stupid idea of altitude and chill, and paid it with a strong headache plus some other symptoms. What an extreme experience with very special people O_O Besides, we realized Tanzania is a beautiful country owned by the Coca-Cola company. We were said to leave early from FRA airport, but it turned out snow set in while we boarded the plane. So, the plane had to line for the de-icing zone and wasted too much time. 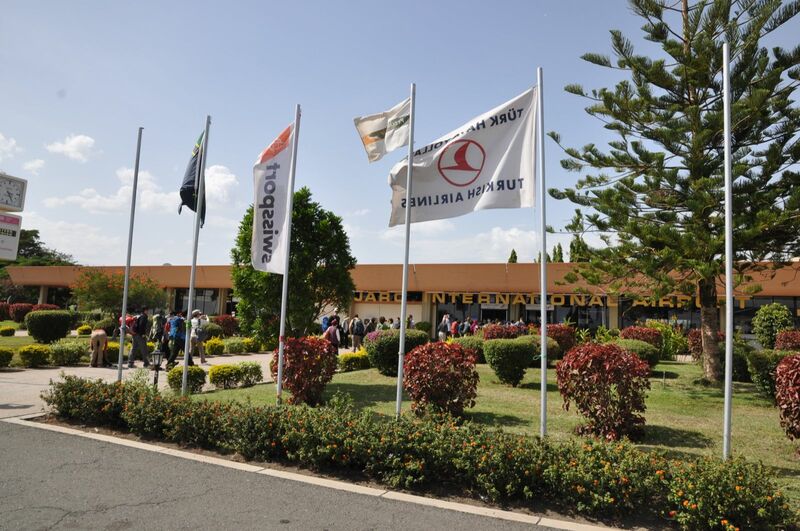 We just so made it to catch our connecting flight to Tanzania, expecting our luggage to have made it, too. 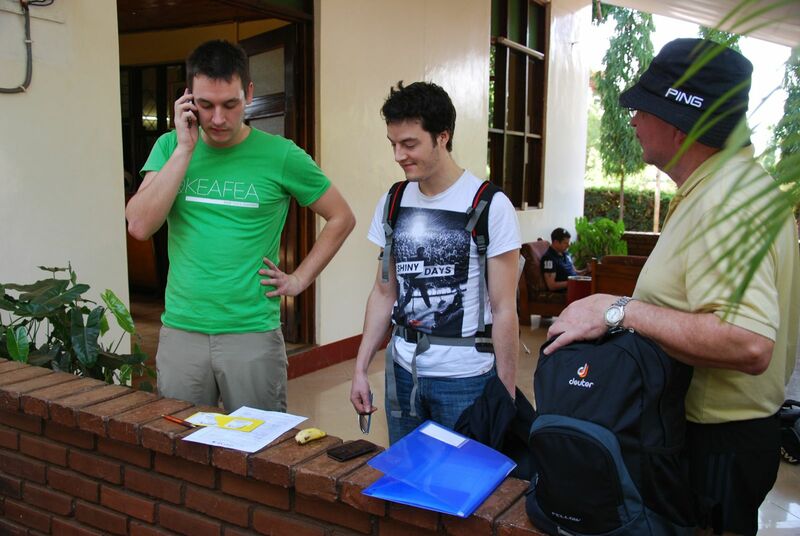 Upon our arrival at a tiny, little airport in the middle of nowhere between Moshi and Arusha, Tanzania, we had to pay 50$ for our visa to be granted access to Tanzania. We arrived with all necessary vaccinations and, thus, fulfilled all criteria. Next, we waited patiently for our luggage for more than 45 min. All other passengers were long gone, but our equipment didn’t show up. Also not with the second (and last) plane landing that day (there are only 3-5 planes per day). We walked to the counter next to the single luggage carousel in that airport and asked for assistance. There was one guy who himself is the rep for all airlines owning the single office available. He asked us to sign a form and we saw our chances at near zero to get any help here. Not having our luggage was a worst case situation! All the equipment for our ascend to the peak was neatly packed in there. We were puzzled how we gonna start our trip the next day and if that was the end of our trip, meaning 6 months preparation for basically nada. In short: our trip was put at risk, … even worse: we started planning how to travel back home. Next, a driver picked us up at the airport and we asked him to take us to the office of the local travel guide to figure out what to do without equipment. After all, he assured us we need the equipment and chipped in a solution to our situation. The chances are our equipment arrives within next days. He rest us assured some sherpas bring it up to the mountain while we would prepare to catch up. Still, we couldn’t go further than we are able to without any equipment. And, catching up will eat up the energy savings in our bodies that we desperately need to make to the peak. 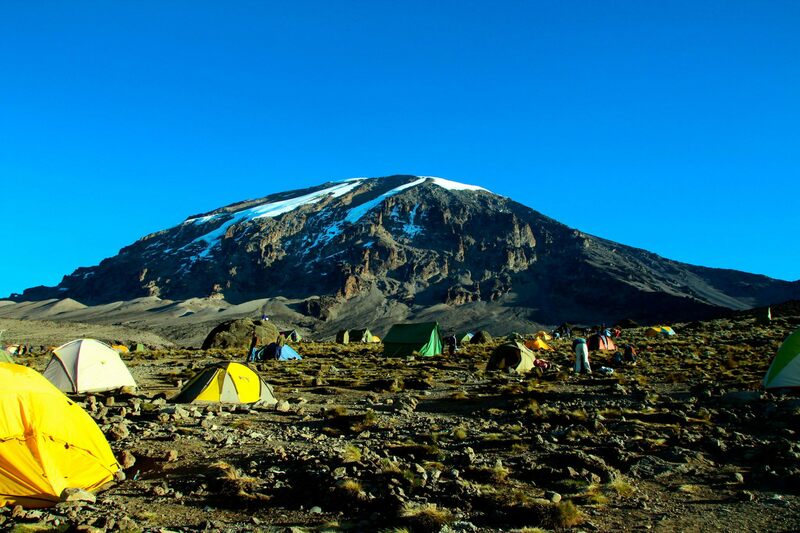 In our heads the idea of leaving Tanzania without ever touching ground close to the mountain gained more space. The only chance we have is to gain some information and plan out all options. We called the airline that obviously caused us trouble by not doing their job. That means a call from Moshi, Tanzania, in a very unstable cell network (with an “antenna gate” iPhone 4) to Doha, Qatar, to a support line which keeps you on hold, speaks Arabian and costs some extra fees. One of the worst conditions for a call. However, I made some conversation despite the conditions and we were promised the luggage arrives the next day as it is scheduled to be on the next Qatar airways plane. 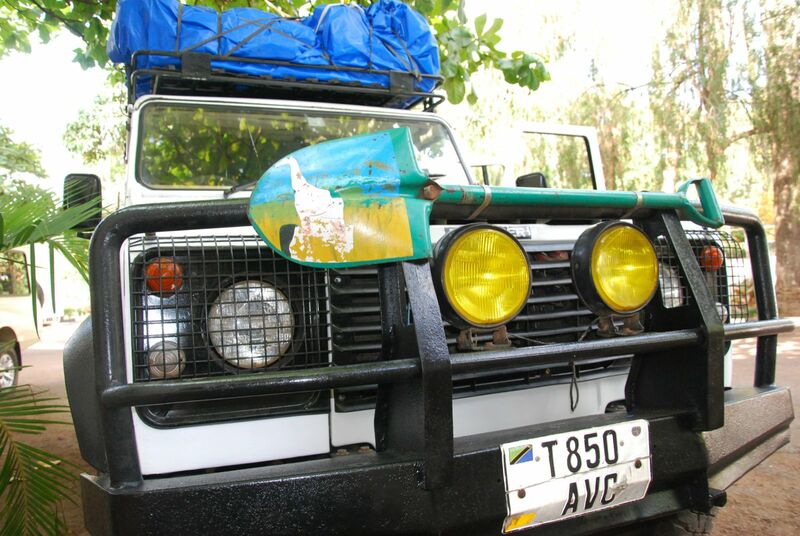 Fortunately, the airline’s statement proofed true and we got our equipment the next day after waiting for 1 or 2 hours in a small village on the way to the national park. A driver we met there delivered our luggage in a taxi run. While waiting, we had a coke from a bar man behind bars and locals stared at us. Meat was hanging in windows sizzling in the noon sun. Every second building or so was covered with Coca-Cola ad signs. Assumably, the signs are used to repair the buildings and save on painting. Later on, we noticed that even the official hospital signs are actually Coca-Cola ads. 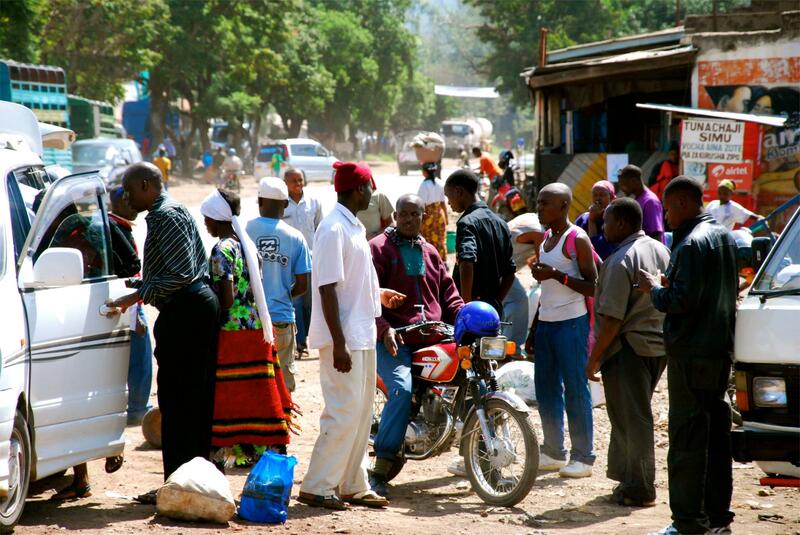 Tanzania is like a whole Coca-Cola advertisement: red colored signs and Coca-Cola logos everywhere. 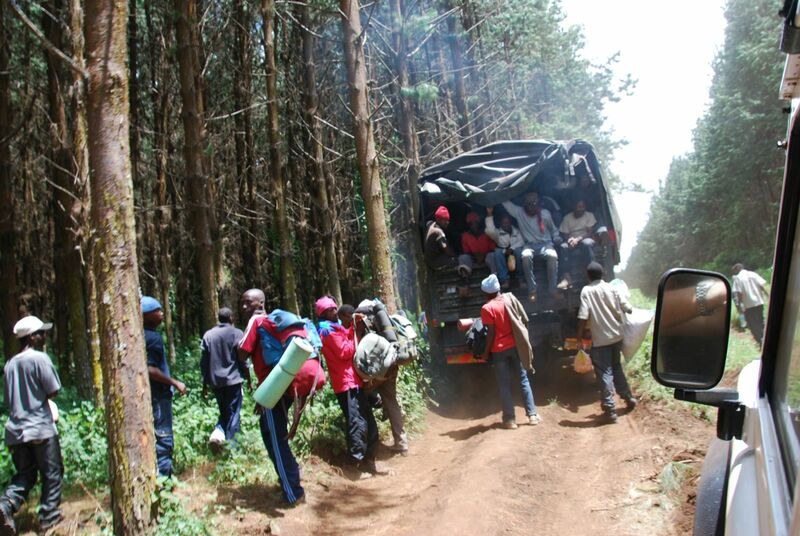 From the small village our trip started to the entrance of the Kilimanjaro Nationalpark. 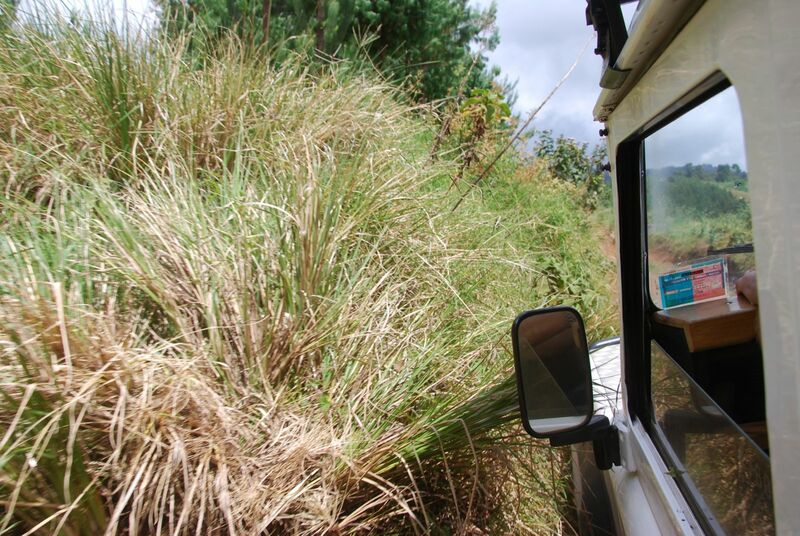 We were carried in a formidable 4WD wagon. The park entrance is our first stop. There we had to sign in and fees for the entrance were paid. Besides, the porters assigned the luggage according to weight and other inscrutable factors – such as body strength, age, height. While we continued in our 4WD shovel-equipped monster, the porters were sitting on and walking by trucks to get into the national park. On our way to the national park, the street abruptly turned into … ehm … no street but many pebbles and bolders. Our jeep is pound by the pebbles on the street and windows started to crack. No need to slow down. We passed by wooden tribe villages, partly covered with red coca-cola signs. Eventually, we find ourselves in the hill & jungle landscape we all expected for that day. 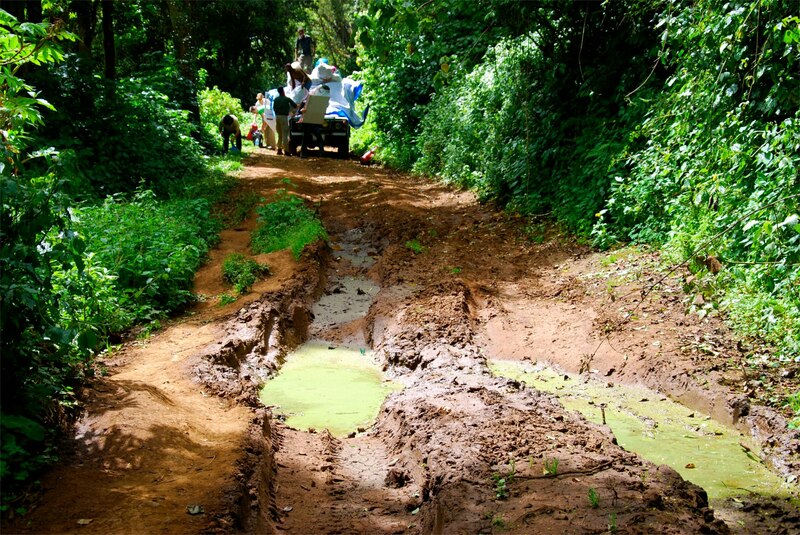 The road now became a red mud monster with two parallel, deep tracks that swallow the wheels of our jeep. Already does our Landrover moan in his endeavor to bring us up to thestarting point of our route in the middle of the jungle. 5 adventurers, 1 guide who didn’t fit into the cramped porter truck, and a driver. Along the way, we passed other groups that have been dropped off far before the jungle. Poor Guys! According to their faces, they envied the our moaning Landrover which serves perfectly to protect 5 Germans from the equator sun. And, we were happy we haven’t had to walk additional kilometers the first day. 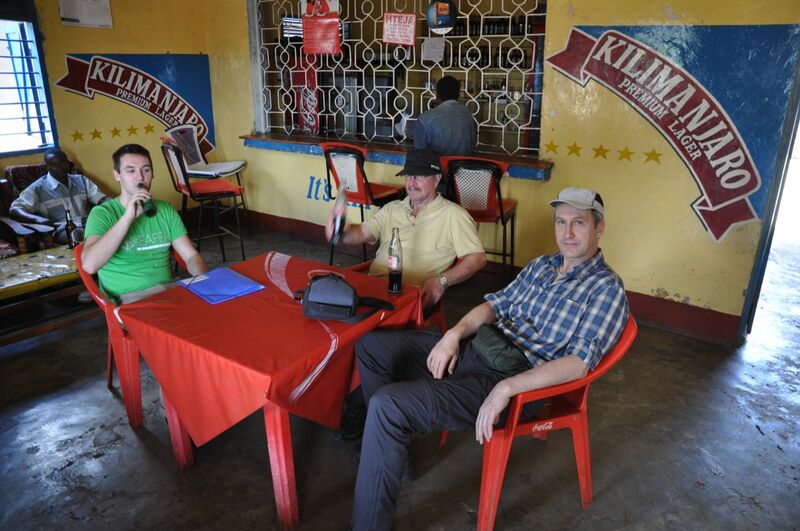 After arriving at the port to our tour, in the midst of the jungle, we were told to have lunch. Monkeys jumped from branch to branch over our heads. Other groups and overloaded porters in flip flops passed by us, peaking at our burgers and drinks. After lunch, the luxury and fun part of our tour ended. We had to actually make some progress by foot. And the steep paths in the jungle pulled us back to the hard, exhausting mountain hiking reality from our sweet, comfortable Landrover spot. Rain set in for a while, turning the red muddy path into a red swamp. Nevertheless, we finished our 10 km tour that day easily. The scenery distracted us too much from actually realizing the exhaustiveness of our hike. Trees are huge in the jungle and left us stunned. Monkeys and weird jungle birds have given us the chance to take breaks and use a spy glass to observe. The night was calm – except of some monkey noises that woke up some of us. The night sky at Mt. Kilimanjaro is impressive. No light pollution and all the star constellations only visible at the equator. The next morning we started early after some breakfast – toast, disgusting english slime food (porridge), and other untasty stuff. The temperatures where still comfortable and not too hot, but the sun started glimpsing through the jungle trees. While we continued our hike, the vegetation changed from wet jungle to man-high bushes. Meanwhile, the sun became more intense and temperatures passed 34°C. Together with the vegetation also the terrain had changed. Now we could oversee where we were walking towards. We obviously are at a mountain and we had a steep hike through a bushland before us. Porters already started to overtake and pass by, and still, some were wearing only thongs/flip flops. At the end of the day we really were happy to have had some breaks along the 14km tour. With the sun, high temperatures, and the steep ascends, we clearly felt how exhausting this day was. After celebrating our sign in at the ranger’s book, we had some good sleep before us. The new morning introduced handicaps for a few adventurers in our group. For Willi, Sebastian, and me, a headache became a new companion. For Sebastian also his knees started to hurt. We suspected the strong sun to be the reason for our headaches. We were proven wrong later, at least partially. 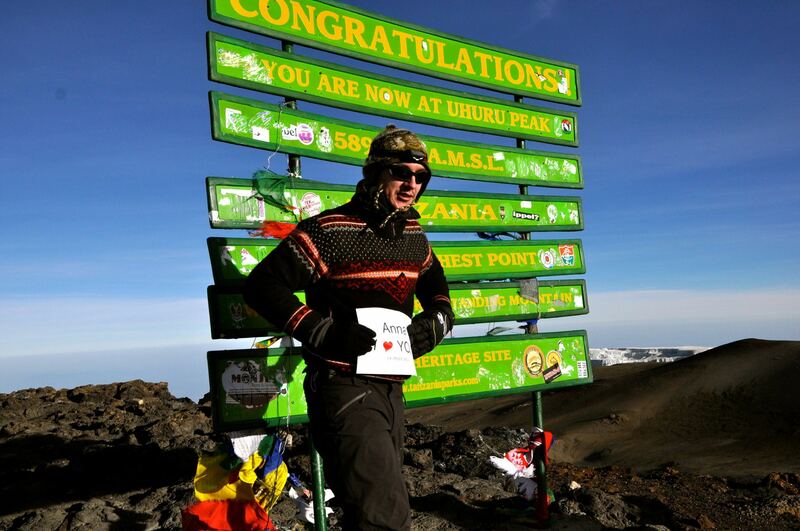 The next day we continued our ascend and got beyond 4000m altitude for the first time. 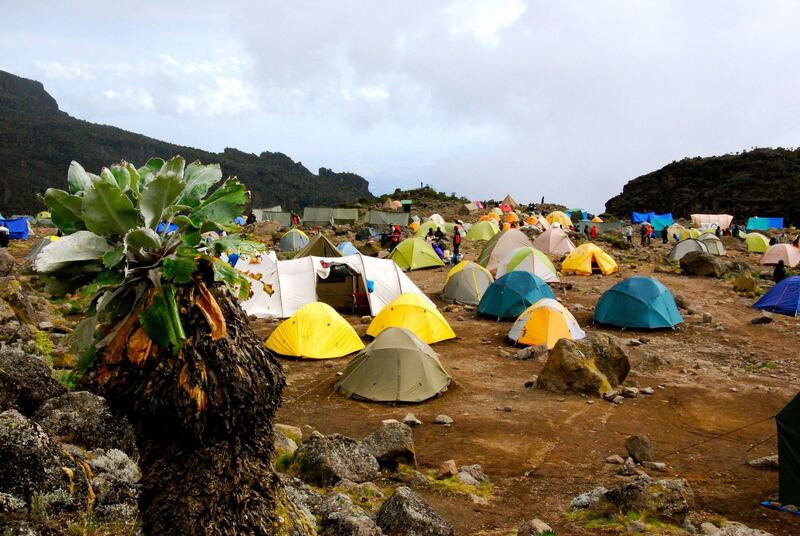 In our camp even the smelly restrooms – holes in the ground with a wall and window – had an excellent view across the lowlands and Mount Meru. Temperatures especially during the night dropped from now on. Good we invested a few coins in our sleeping bags. Marches were long now, but not too steep anymore. We had a test before us. The lava tower is a formation of huge rocks at 4600m altitude. It’s a test on how good we can take a rise of 600m altitude after a few hours hike, getting back to a camp at 4000m later.The headaches we presumed to be due to th strong equator sun turned out as caused by something more impeding: altitude sickness. Now, all of us could feel the pain of altitude sickness. It hit me really hard and others suffered heavily from altitude sickness, too. At 4600m I was close to fainting. First thing in the morning we admired a giant wall of rocks while brushing teeth. It is the challenge of the day to climb the barranco wall. There is a single path up the wall, and a line of hikers formed at sunrise. We joined the crowd of hikers which already got jammed by unexercised fellows in the front. 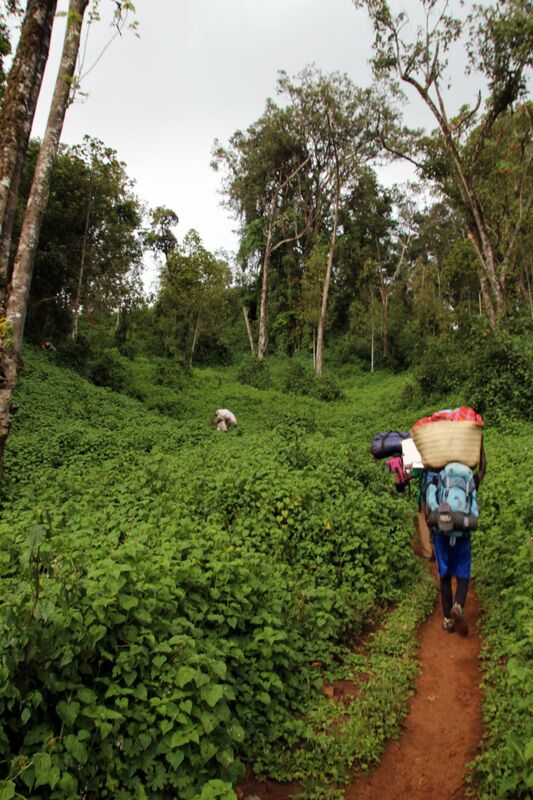 The porters didn’t take it and went on their own paths, wearing thongs and carrying 20kg+ of baggage. It made us shiver when they lost traction on the wall now and then. The next night the ascend to 5982m was to begin. Sleeping wasn’t for long before the ascend and the noisy winds kept us awake. 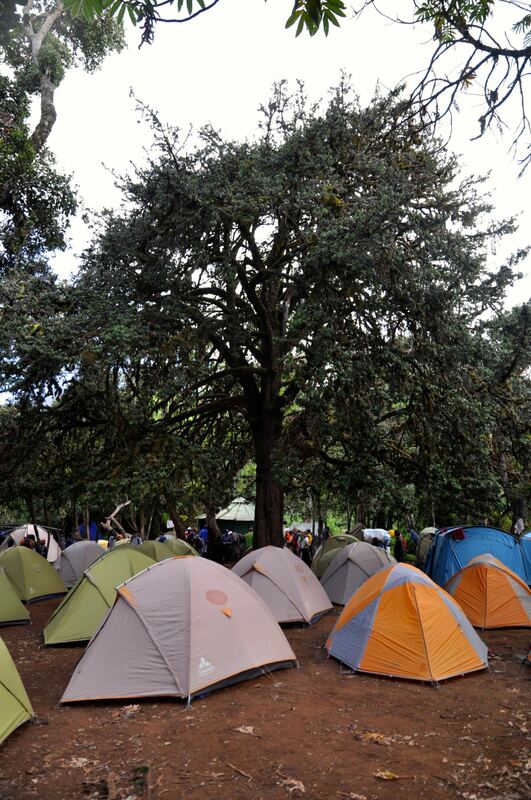 At midnight we gathered before our tents, heavily prepared to conquer Mount Kilimanjaro. We wore headlights, our professional hiking shoes, multiple layers of trousers, sweaters and windbreakers, socks, gloves and winter gloves, and woolen hats. From the camp we observed the line of headlights slowly moving up the mountain. We followed and mingled. At the same time I noticed some familiar voices. Some of my group were close by I presumed. And indeed, some fellows walked right in front of me what means I catched up. The last very exhausting steps before us and eventually we will have made it to the point we planned to stop to watch the sunrise. And we were still on time. After all of us gathered to spectate the sunrise from 5800m+ we started congratulating, hugging and feeling alive. 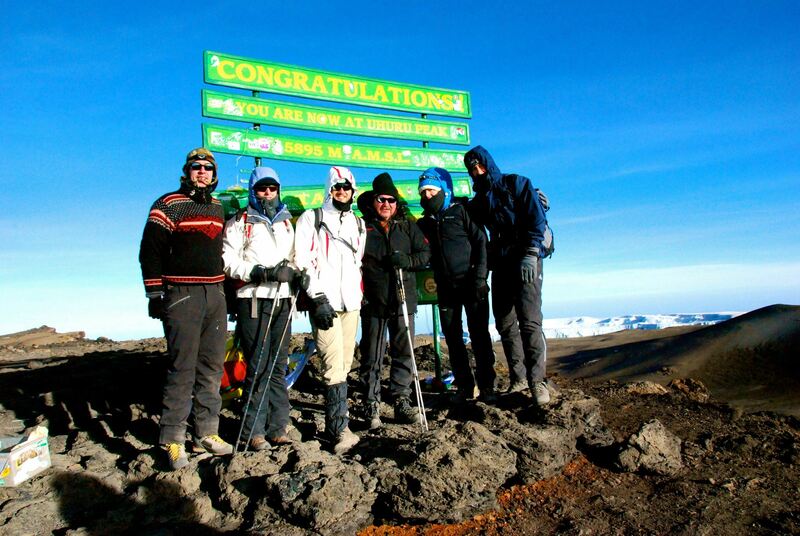 We started to realize that we just achieved the goal of our journey, reaching the top of Mt. Kilimanjaro, or at least being in a few hundreds meter distance of the actual peak. It is an unforgettable, emotional experience. Of course, we were and are very grateful for our guides to get us all the way up here. Ultimately, we documented our success with pictures of the actual peak and the sunrise. For the photos, I hauled out a sheet of paper with an important message yet to deliver. It was not that easy to get hold of the paper with numb fingers. Eventually, I got setup for the photo and send a love message to my honey Anna-Karolina! 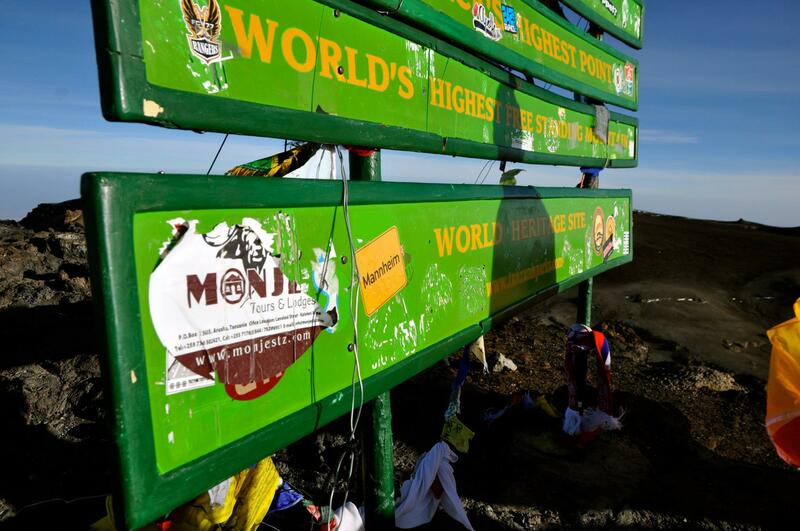 Besides, I had to put a “Mannheim” sticker on the Kilimanjaro sign. Proof I did in the photos below. Our descent began a mere 30 minutes after we reached the top. We had a descent of 14km before us, after an exhausting 7km ascend. 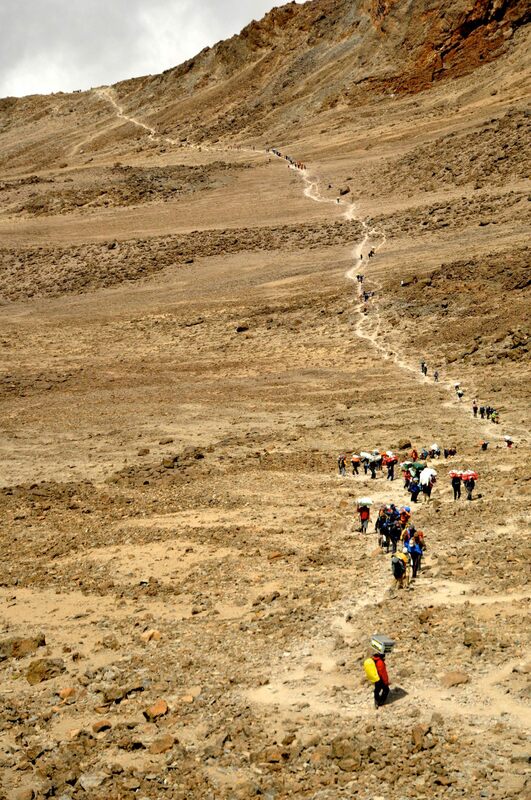 The first kilometers from the top let us realize what that torturous path looks like during day. Instead of the winding path we telemarked down a sandy slope to speed up our descend. Dangerous due to small and big pebbles and stones. After a long hiking day we arrived in our final camp, in midst of the jungle. Beers were due for that night and we started to reflect our trip. On our last day the hike through the jungle continued. Vegetation was rich, colorful, and interesting. As on our first day in the jungle, we met monkeys and discovered the fauna. The hiking path we followed ended at a registration office. At a parking space right next to the office, multiple trucks waited to pick up tourists and porters – obviously more porters than tourists. 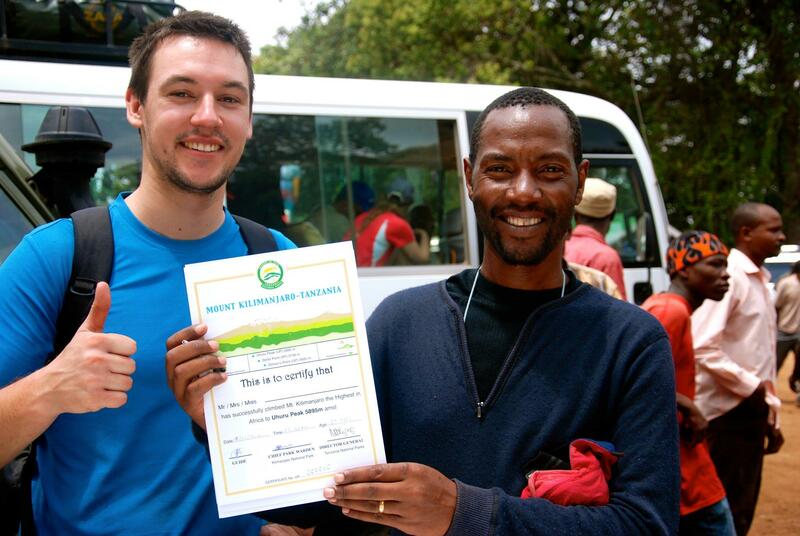 We gifted parts of our equipment to our porters in a sort of official act. The office asked us to fill out a survey and our guide handed us a certificate which is to document our successful mission. The night after our arrival back at the hotel was long. We had a plethora of reasons to celebrate our safe return. 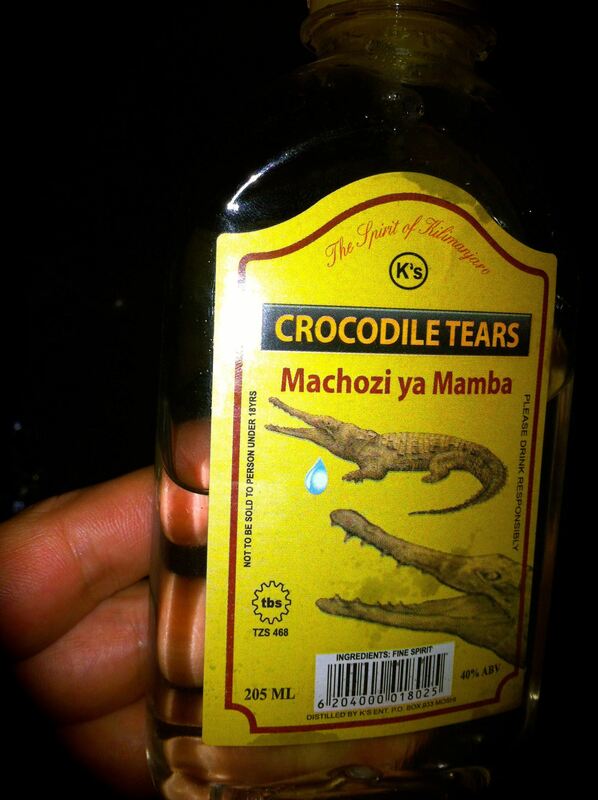 The last memory I can recall is someone pouring crocodile tears in my cup. I think we had quite some fun. In retrospective, the trip and the challenge to climb Mt. 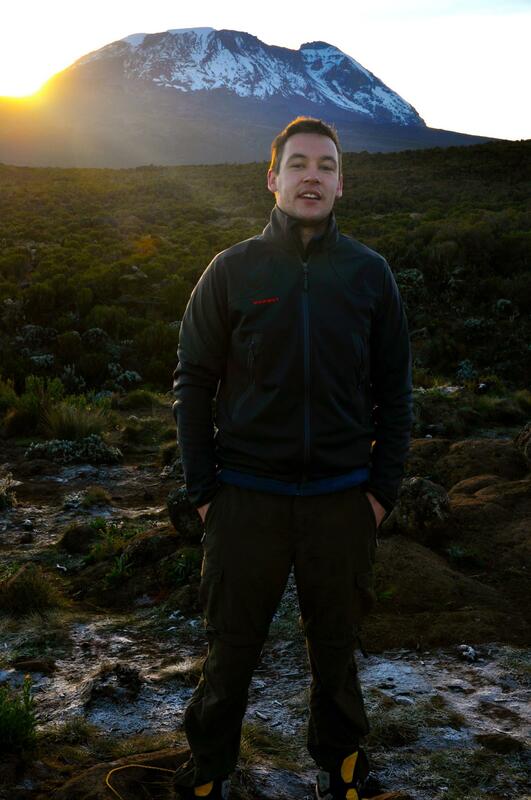 Kilimanjaro were a striking experience. Never have I been pushed to my limits like this before. Mt. 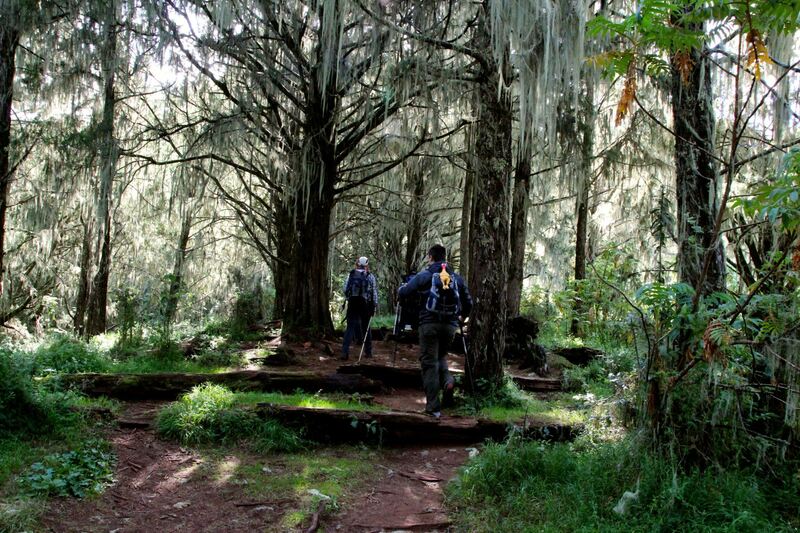 Kilimanjaro is great for anyone seeking for some adventure and eager to test himself in altitude. Moreover, I finally got to see the devastating situation of Africa’s poorest countries. We are some lucky bastards in Europe and should be very grateful. Changing the situation to the better for Africa is definitely long overdue!